This is the only Pro LED Kit that comes with a rotating disc and has all the tools you need to get started. "This light box is stable, comfortable and turely beautiful." *New Easel Design Pro Animation Lightbox with 12f Rotating Disc, LED LIGHTING which is equal to 150watts of incondescent light. Footprint is 23" x 24"x 4" with a 18" rotating disc. The New top is made of white MDF with black banding the same as our pro station with lid support and base of attractive and durable wood. The 3/4" MDF top will not warp and is more durable and easier to clean. The hole is 16 3/8" and will support any pro disc on the market. 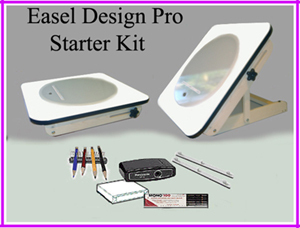 If you are ordering another style Pro Disc you may order our Easel Design Pro Animation Lightbox without our Student Pro Disc.